Located within the city confines of Rio de Janeiro, Copacobana Beach with its four km coastline is one the most popular beaches in the world. Copacabana boasts of soft white sand and pristine waters. The beach with is long coastline has numerous restaurants, bars, night clubs, hotels and apartment blocks. The beach often gets a little crowded with thousandths of people in in biknis and shorts soaking in the Sun lying the by shore. 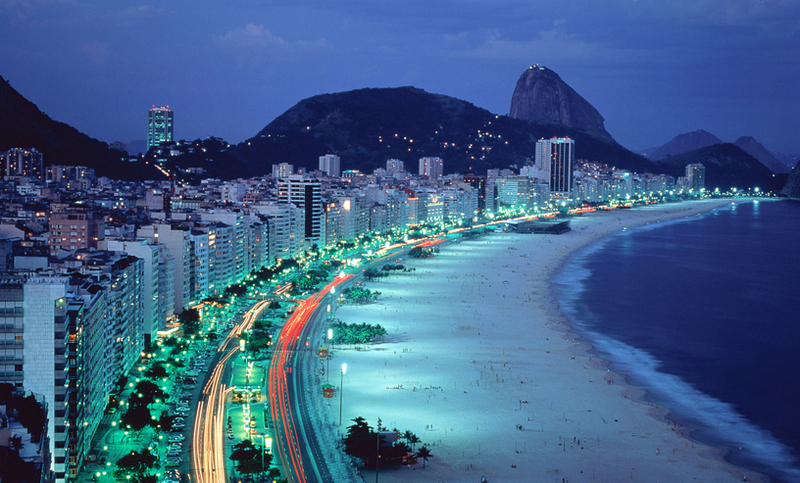 Infact that is expected because Copacabana is famous for its festive and joyous atmosphere. Sports is a key component of Brazilian life and your going to find a lot of people engaged in some kind of sport at the Copacabana. 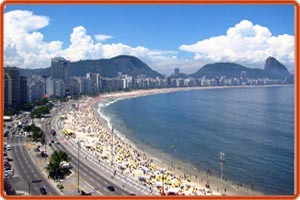 Activities on Copacabana beach include volleyball, beach football, water sports and all night partying. There are innumerable number of food vendors who will make sure you never go hungry and there are also a lot of hotels that offer affordable accommodation. However when the beach gets a little crowded petty thefts may occur. Hence its advisable for you to leave your valuables behind when you plan a trip to the Copacobana.